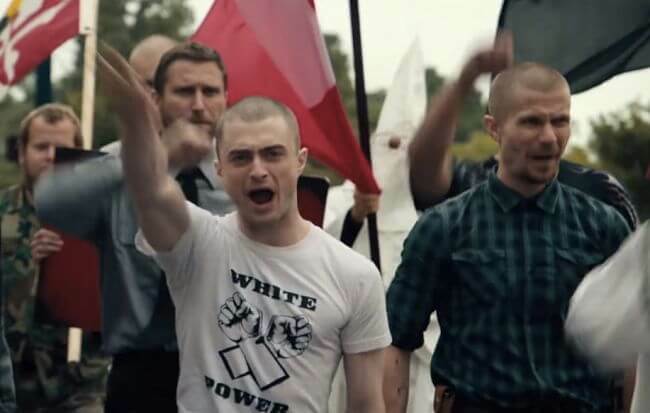 Imperium is a well acted, deeply disturbing movie about the little talked about topic of domestic terrorism, particularly of the “white supremacy” type. It features an idealistic FBI agent, Nate Foster (played by the excellent Daniel Radcliffe, he of Harry Potter memory), who is enlisted in an undercover operation by higher level operative Angela Zamparo (played by the ever fascinating Toni Collette). Agent Foster is a good Stoic character, and the very end of the movie (minor spoilers ahead) could have been written by Seneca. Foster is initially reluctant to embark in the operation, protesting that he just doesn’t have the physique and fighting techniques to get out of trouble, should the need arise. To which Zamparo answers that if he actually got himself in that sort of situation his mission would have already failed, and he would likely end up dead anyway. Being an undercover agent is not about fighting bad guys 007-style, it’s a game of intelligence and cunning. There is no need to get into the details of the plot, since they are actually not relevant to my main point here. Suffice to say that our hero manages to infiltrate the white supremacy underworld, which is apparently divided into a number of distinct camps that fight amongst themselves for dominance — there are the juvenile skinheads vs the Ku Klux Klan vs the militarized neo-Nazis, and so forth. It turns out that most of these people are more bluster and talk than action, human beings who desperately want to make a difference, to react against a system they see — with some reason — as oppressing them. But of course they lack wisdom, and therefore direct their anger toward the wrong targets: immigrants and minorities, rather than the moneyed elite who exploits them while laughing all the way to their offshore bank accounts and outsided villas. One of the strengths of Imperium is that the “villains” — even the really dangerous ones, who eventually do make an appearance, after a number of dead ends pursued by Foster and Zamparo — are portrayed as three-dimensional individuals. They are highly deficient human beings, of course, but it becomes increasingly obvious that they need to be pitied, not hated. Indeed, one of the minor characters is the very young, and very angry, Johnny (played by Devin Druid), who undertakes exactly the sort of transformation that any good Stoic would wish on the rest of humankind. Agent Foster displays a good range of Stoic virtues throughout the movie. He is obviously courageous — both in the sense of having physical courage, despite his inadequacy to the task at hand, and in the sense of moral courage to doggedly pursue what he believes to be right. He has a strong sense of justice, not in the sense of subscribing to some grand scheme of how things ought to be, but in the much more direct one of treating others to the best of his abilities — including his enemies and the very people he is bound to betray in the pursuit of his job as an undercover federal agent. While there is not much occasion for Foster to exercise temperance in the movie (though there are a couple of scenes where he may be interpreted as doing so), but he shows himself capable of arguably the most important virtue: practical wisdom. Not only it is wisdom that allows him to defuse a couple of really tricky situations, but by the end of it all he has a conversation with Zamparo in which they both arrive at a profound insight on what has happened, and more broadly on human nature. The back-and-forth reflects (unintentionally on the part of the scriptwriters, I’m sure) two fundamental Stoic doctrines. Zamparo is talking about lack of resilience and the sort of moral compass that comes from inner strength, deficiencies that lead to a culture of victimhood that — under certain circumstances — turns violent. We have seen this sort of mechanism in operation in Hitler’s Germany as much as in Mussolini’s Italy, and we are seeing it now again across the world, from the bewildering success of Islamic terrorist groups like ISIS to the equally astounding resonance of the message of Western politicians like Donald Trump. Foster’s response, however, reminded me of the Stoic “developmental” theory of virtue. We are all humans, all made of the same cosmic stuff, and all capable of living according to nature — i.e., of applying reason to our own betterment and the betterment of society. But we develop into morally responsible adults in a variety of ways, with a corresponding variety of outcomes. The same glorious elements, but they do need to be wisely mingled. This entry was posted in Stoicism & pop culture on September 1, 2016 by Massimo. Off OP: If true (and it seems to me to contain at least a grain of truth) how does this affect the Stoic world view which seems to presume we can ‘know ourselves’ and ‘control ourselves’? Read Ryle’s ‘Concept of Mind’ a long time ago and thought it made a lot of sense, but no longer remember it that well. remember: us government infiltrates the good guys, too, using same techniques [eg, see fbi file on mlk]. it’s the culture of first-world entitlement – entitlement to the lives, labor and resources of other peoples – and the culture of treating others as means to effect the fruits of this entitlement — that creates ‘cultures of victimhood.’. as chomsky says, if you want to stop terrorism, first stop participating in it. I think this whole “you don’t really know what you think” thing is an exaggerated fashion. Yes, human minds are complicated, prone to biases, and resist introspection. That’s all the more reason to pay attention and train oneself to think better. I don’t think it’s only first world governments who do that. We have plenty of nasty examples the world over. No the Iraqi troops didn’t do that. The Iraqi dictator did worse things to its citizens than the US government does to its citizens, though. Which, I hasten to say, did not justify the invasion. It just makes the point that the problem you point toward isn’t just a first-world one. i was called by your characterization of the success of isis as ‘bewildering’, as i don’t think so. i pointed out how cultures of victimhood are created by cultures of victimization. the iraqi dictator (armed by the 1st world) did terrible things to his citizens, but the us, because it has all the power of the 1st world, has done far worse to that citizenry.